Hello. My 69 FHC front left turn signal works but the front right does not. I decided to remove the fixtures because it looks like they were not cleaned up well during the restore of my car. One concern is that they don’t match. The left one has only one bulb. The right one has 2 bulbs. Also notice the wiring difference on the fixtures. My meter is not showing any power to the wires for the right signal so I suppose I need to look upstream at the relay or the hazard switch? You really need the wiring diagram to find the fault. Do all the lights work when the hazards are switched on? If so, then you can confirm the wiring to the bulb is good. As the left hand side is good, then you know the flasher relay works ok. As both lights on the right don’t work, I’d suspect the switch or the wiring immediately after it. There’s a bundle under the dash on mine that has given problems in the past. Intermittent bullet connector continuity! As for the dissimilar lamps, maybe you have one off a series 3? Series 2 lights, for the UK at least, should have direction indicators and side lights. Thanks Tom. I’m actually worried about the wiring diagram issue because as you can see there are some non-standard colors in those wires hanging out of the right hand side (blue and white). 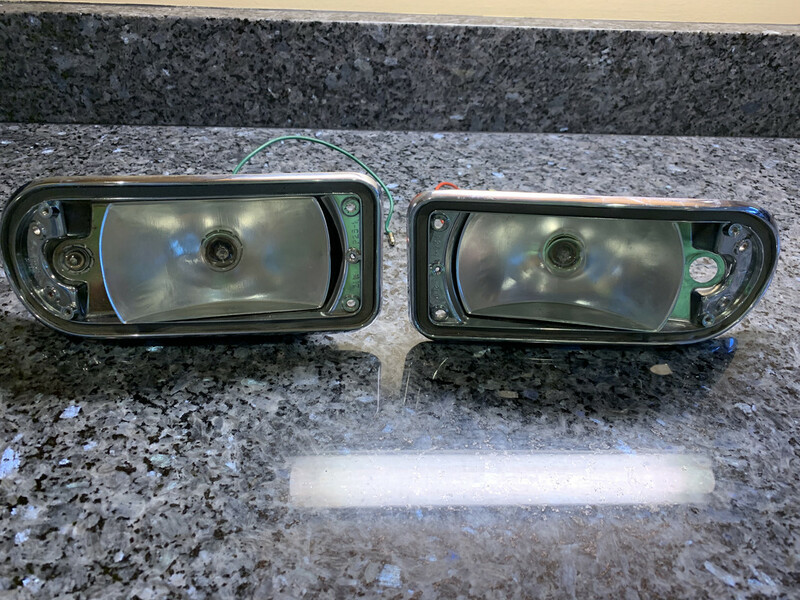 The light housing you have with one bulb holder is for a US spec car or a Series 3 and the one with two is for a UK spec car with side lights that have the split amber and clear lens. On a Series 2 car the current for the indicators passes through the stalk switch AND the hazard rocker switch so both need checking along with the bullet connectors on the stalk switch and under the dash at the bottom of the screen pillars. The bonnet multi pin connector is another area to check. This is all assuming you have ruled out a bad connection at the bulb holder. The centre pin on the bulb holder should be the live terminal and the outer bayonet or screw part the earth. My car is a 69 US spec but all wiring harnesses have been replaced by the person who did the bulk of the restoration. I’ll do some digging around with this info. Thanks again! Hello. I’ve had quite an adventure. One of the things I decided to do is simplify the connections by eleiminating the terminal block inside the hood. I used heat shrink connectors and heat shrink rubber tubing instead. The wiring for the signal was detached at the bonnet pin connector....both sides of it actually. The bad news is that the front signals are reversed now (left and right) and high beam low beam are reversed. I used the wiring diagrams posted for the S2 so I know my wire colors are correct. I believe the signal wires must need to be corrected in the dash. Either the flasher or at the stalk? Issue with the high beams is that the blue light is on in the dash gauge when low beams are on. The journey continues! Thanks all!